While trees visually enhance and add character to any neighbourhood, here are some of the other great benefits of living in a leafy suburb you may not have thought of. By increasing the street appeal and neighbourhood aesthetics, trees can help to appeal to buyers, contributing to property value within the area. Recent research by the University of Queensland has shown that trees really can boost your home's value. This is why it so important to look at 'green infrastructure' including street trees when considering building, whether you are looking for your next family home or are investing. 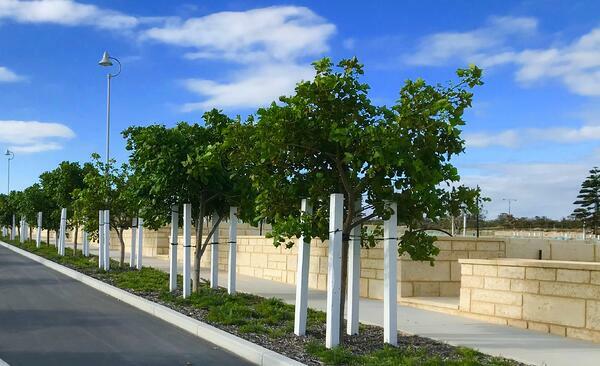 In Stage One at Jindee, each street features a different tree, from the leafy Coral Trees you'll see on Limestone Street to the beautiful Cape Lilacs along Swimmer Terrace. Feature trees are also at the end of most streets to form what is known as 'terminating vistas'. All of this means a more appealing - and valuable - neighbourhood. There is no shortage of studies pointing to the health benefits of trees, for example by encouraging people to get out and exercise more. In fact, the Heart Foundation urges local governments to use tree planting and landscaping along streets and in open spaces for this very reason. According to the Heart Foundation, the presence of trees is even associated with reduced incidence of type 2 diabetes and heart attacks as well as lowering the risk of skin cancer. And it’s not just physical – living in an area filled with shady trees gives your mental health a boost too. There’s nothing quite like a Perth summer but those hot summer days can become intense. Tree canopies take some of the heat out of those days, reducing temperatures of the areas they shade by as much as 25%. They also provide atmospheric cooling through a process called evapotranspiration and reduce glare. Trees, if strategically selected and planted, provide shade which can reduce reliance on air conditioning in your home over summer. Lower energy bills? Yes please! Trees play a crucial function in improving air quality, trapping dust and particulates. By absorbing airborne pollutants, trees are even are linked to lower levels of childhood asthma. You would also be well aware of how important trees are in helping to reduce the impact of global warming. They do this by removing carbon removing from the atmosphere – the more trees there are, the better our planet is! Trees are also helpful in rainy weather, working to slow stormwater flow rates, reducing runoff and filtering heavy metals from water through their leaves and roots. This all leads to better water quality. Many species of birds, mammals, insects and other wildlife rely on trees to give them both shelter and important food sources. So trees have the potential to make us healthier and happier, our neighbourhoods prettier, our properties more valuable and our environment more sustainable. On top of all that, they can even bring about social benefits. Jindee has been planned carefully to draw people outside of their homes and to socialise within their community and trees play a role in this. Green urban spaces and tree lined streets encourage the community to gather and interact, adding to the sense of belonging and community cohesion. They help make the estate more immersive, encouraging people to head out to explore their neighbourhood's different zones. At Jindee, all of the trees have been carefully selected to ensure they will maximise the above benefits and provide real shade, including species such as Tipuana Tipus and Figs. The Tipuanu Tipus trees planted along Oceania Ave are on a five year pruning plan to be shaped into a stunning shady arch along the main street and footpath down to the village and foreshore. Want to see for yourself how trees are a big part of the vision for Jindee? Give Nicola a call on 1800 JINDEE or pop into our sales office on the corner of Marmion Avenue & Oceania Ave, Jindalee – she will be happy to show you around.